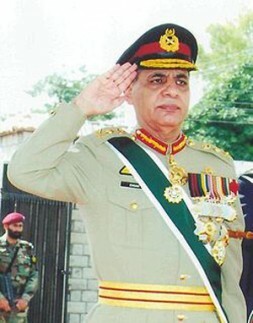 Former Pakistani Chairman Joint Chiefs of Staff (until 2007) and director of the Inter-Services Intelligence (ISI), Gen (ret.) Ehsan ul Haq, on the ISAF mission in Afghanistan: "The timeframe, at present, doesn’t indicate the projected political situation or capability of effective governance. In the absence of significant progress towards a political solution, I do not foresee the security objectives being achieved. Although three more years may be sufficient to achieve the planned personnel ceiling of the security forces, it seems unrealistic to project that Afghan Security Forces would be able to handle the security challenges without significant international support." Gen (ret.) Ehsan ul Haq, former Chairman of the Joint Chiefs of Staff of the Pakistani Military and director of the Inter-Services Intelligence (ISI), and now a member of the International Advisory Board of WSN, discussed with WSN President Dr. Hubertus Hoffmann the current political difficulties in Pakistan and Afghanistan, explained his top priorities for the ISAF mission in Afghanistan, negotiations with the Taliban, as well as domestic Pakistani politics, the safety of its nuclear arsenal and the Kashmir conflict with India. Hubertus Hoffmann: How should negotiations with the Taliban be organized? Who should be part of it? Should ISAF wait for a military success before they start? Ehsan ul Haq: There have been repeated US assertions that there is no military solution to the conflict in Afghanistan and that the US/NATO forces are not there permanently. These unequivocal pronouncements and President Obama’s strategy, highlighting a shift to the political track, evoked optimism towards a solution. However, the operationalization of the strategy only witnessed a military surge, while the progress of the political track has yet to show any progress. There is a strengthening perception that the political track has been relegated to the conditioning of the operational environment by the progress of the surge. Efforts to seek a political solution must be undertaken simultaneously and reinforced to achieve meaningful progress. To facilitate early commencement of dialogue/negotiations, it is essential to structure a framework that could guide this process. The framework should recognize the principal stake holders and the prime adversary, list their demands/interests and propose a roadmap for the dialogue process. The process would have to be initiated through credible intermediaries who have the trust of the principal adversaries. While initially indirect, the effort should be to rapidly progress to direct contacts between the principal adversaries. Hubertus Hoffmann: How do you see the future of Afghanistan after 2014? Ehsan ul Haq: 2014 as a milestone is related to security-centric objectives. This is the time at which the Afghan security forces are planned to be raised, trained and enabled to shoulder the responsibilities for internal security throughout the country. It is also the time line for complete withdrawal of US (and other foreign) forces from Afghanistan. The timeframe, at present, doesn’t indicate the projected political situation or capability of effective governance. In the absence of significant progress towards a political solution, I do not foresee the security objectives being achieved. Although three more years may be sufficient to achieve the planned personnel ceiling of the security forces, it seems unrealistic to project that they would be able to handle the security challenges without significant international support. With the withdrawal of US/NATO forces, and in the absence of an inclusive political solution, Afghanistan is likely to relapse into a civil war as witnessed in the wake of the Soviet withdrawal and the consequent collapse of the Najibullah regime. Hubertus Hoffmann: What should be the role of Pakistan in these reconciliation talks and after 2014? Ehsan ul Haq: No country has suffered more on account of the strife in Afghanistan than Pakistan. A peaceful and stable Afghanistan is in its best interest, because Pakistan cannot hope to achieve internal peace without it. Pakistan has legitimate and vital stakes in the future of Afghanistan. However, in the current environment of pessimism about the success of the military strategy and progress of the peace track, there is a distinct attempt to malign Pakistan, overburdening it with unrealistic expectations militarily and its so-called influence over the Taliban. Pakistan must do its utmost to support the initiation and success of a peace process that could lead to termination of violence, a stable and inclusive political dispensation and a safe early exist for all foreign forces. However, it needs to be careful in accurately assessing and projecting its real influence (and trust) with the warring parties and guard against being embroiled in the internal situation of Afghanistan. Simultaneously, Pakistan as a high priority, must stabilize, harden and regulate its western border to minimize the fallout from continuing turbulence in Afghanistan post 2014. Hubertus Hoffmann: Still many in the West blame Pakistan for a double-play in North Waziristan protecting the Afghan Taliban - is this true? Ehsan ul Haq: This is a disinformation aimed at belittling Pakistan’s contribution in the struggle against terrorism and supporting the coalition operations in Afghanistan, even at the risk of internal destabilization in Pakistan. It is also an exercise in scapegoating as the follies of military – centric approach and a flawed political strategy have created increasing international uneasiness about continued involvement in Afghanistan. Over the last 10 years, Pakistan has employed more forces, achieved more successes and offered more sacrifices in the struggle against terrorism than any other country. This includes operations against Afghan Taliban and the Haqqani network. A large number of suspected and prominent Afghan Taliban commanders/leaders have been apprehended in Pakistan and many of them handed over to the Afghan government. Pakistan has also made concerted efforts to effectively regulate and even seal its border. However, these efforts have been thwarted by non-cooperation and even resistance by the Afghan authorities. As regards operations in North Waziristan, almost three brigade size forces are deployed to tackle the situation. It should be appreciated that the terrorist elements in Waziristan have caused more damage in Pakistan than Afghanistan. The people and armed forces have demonstrated a strong resolve against terrorism and all challenges to the writ of the state have been defeated. The same will happen in North Waziristan in accordance with Pakistan’s counter insurgency strategy and priorities. Hubertus Hoffmann: How is the political situation in Pakistan now? Ehsan ul Haq: Although Pakistan’s transition to democracy, in the wake of the 2008 general elections, was welcomed, it hasn’t been able to provide a stable political milieu or a leadership which has the trust of the people and the capacity to handle the myriad challenges it confronts. The political scene is marred by a wrangling coalition, without the harmony and resolve, to evolve a consensus on even the most critical national issues, poor governance, rampant corruption, nepotism and cronyism. A weak and unstable government has also lost its moral authority due to its defiance of the judiciary and its inability to effectively manage the fallout of the blasphemy issues. The twin-crises of internal insecurity and political uncertainty have seriously undermined the economy. The consequent inflation and the government’s inability to offer any relief have further alienated the masses from the political leadership, encouraging the opposition to demand mid-term elections. Hubertus Hoffmann: Will the radical Islamists take over power in Pakistan and revolt will start like in Egypt? Ehsan ul Haq: It is unfortunate that either due to lack of information, or with malafide intent, exaggerated dooms-day scenario are projected about Pakistan. Despite a highly adverse regional environment that has created a complex domestic security situation over the last several decades, Pakistan has displayed strong resilience and the capability to face challenges. With a working democracy, having participation of all spectrums of the society, an increasingly assertive media, a vocal civil society, a strong and independent media, it would not be realistic to categorise Pakistan with the autocratic regimes in the Middle East. However the leadership and the elite in Pakistan need to be aware of the increasing public disenchantment on many other counts, particularly the growing gap between the rich and the poor as well as the non- deliverance of essential services by the state/government. Hubertus Hoffmann: How safe are the nuclear weapons in Pakistan? Ehsan ul Haq: Pakistan is acutely conscious of its responsibilities as a nuclear weapon state. The issue of nuclear safety and security is accorded the highest priority and we have made heavy investment to achieve multi – dimensional and robust mechanisms that cover all aspects of security including command and control, export control regime, physical security tiers, intelligence system, counter intelligence, technical measures ( ie Permissive Action Links) and a comprehensive Personnel Reliability Programme (PRP). While one cannot be complacent about such a critical issue, nor can any security be considered absolute, Pakistan has gone to great lengths to ensure that its standards exceed, and not merely come upto the accepted international levels. It is in recognition of these determined efforts that President Obama and the United States Chairman Joint Chiefs of Staff, besides many other dignitaries, have expressed their satisfaction on the security of Pakistan’s nuclear assets. Hubertus Hoffmann: How could the peace - process with India about Kashmir be re-vitalized? Ehsan ul Haq: The resumption of Indo – Pakistan dialogue, covering all outstanding issues, including Kashmir, after a break of two years, is a positive development. Given the chequerred history of such processes in the past, one can only be cautiously optimistic. However it is important that the process moves forward and is made ‘irreversible’, as was proclaimed by the two countries in 2004. The core issue between the two countries continues to be the dispute over Kashmir. Over a period of time, Indian society (and the international community) has been told that whatever awful mess occurs in Kashmir has a Pakistani hand and is aimed at destabilizing India. However with the ascendance of the peace movement, in the Kashmir valley, which has side, lined the extremist forces of violence. India has the opportunity to shun the denial mode and seek a solution to this long outstanding dispute, a solution that fulfils the legitimate aspirations of the Kashmiri people.